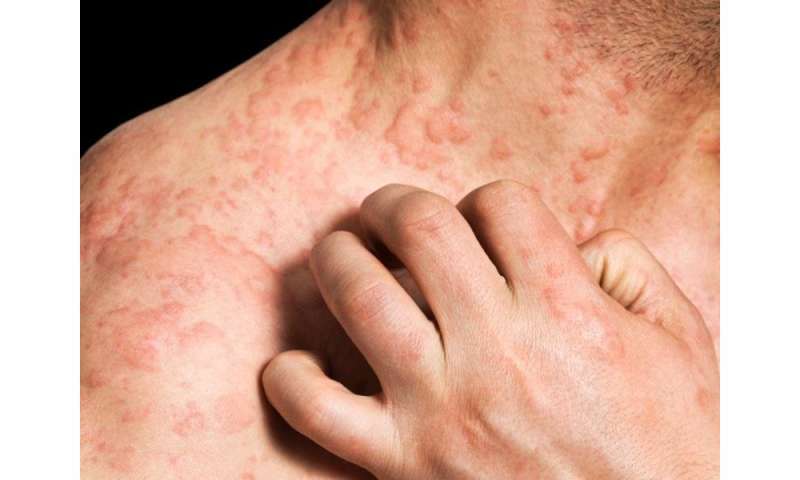 (HealthDay)—Atopic dermatitis (AD) dramatically impacts the quality of life of patients, according to a study published online July 16 in the Annals of Allergy, Asthma & Immunology. Jonathan I. Silverberg, M.D., Ph.D., from Northwestern University in Chicago, and colleagues assessed the patient-burden of AD among 602 U.S. patients. The researchers found that adults with AD reported higher proportions of having only fair/poor overall health, being somewhat/very dissatisfied with life, having lower weighted mean Short-Form 12 (SF-12) mental and physical health subscores, and having higher Dermatology Life Quality Index (DLQI) scores, compared to adults without AD. There were significant stepwise decreases by AD severity for overall health, life satisfaction, and SF-12 mental health, and increases of DLQI scores, when adjusting for socio-demographics and multiple comorbid health disorders. The most burdensome AD symptoms were itch (54.4 percent), excessive dryness/scaling (19.6 percent), and red/inflamed skin (7.2 percent), which led to limiting lifestyle (51.3 percent), avoidance of social interaction (39.1 percent), and impacted activities (43.3 percent). "These data support the heavy burden that AD places on patients, particularly moderate and severe AD," the authors write. Several authors disclosed financial ties to pharmaceutical companies, including Sanofi Genzyme and Regeneron, both of which sponsored the study.